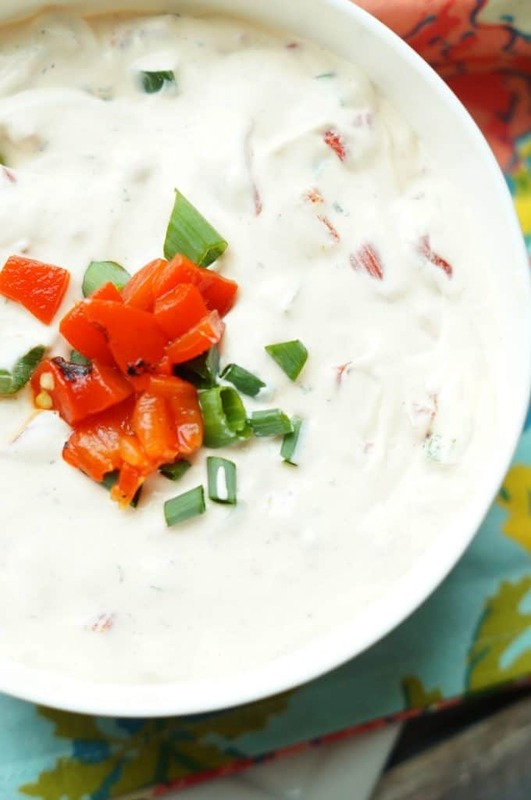 This spicy roasted red pepper ranch dip is a little bit spicy, a little bit sweet, and full of flavor thanks to the ranch! 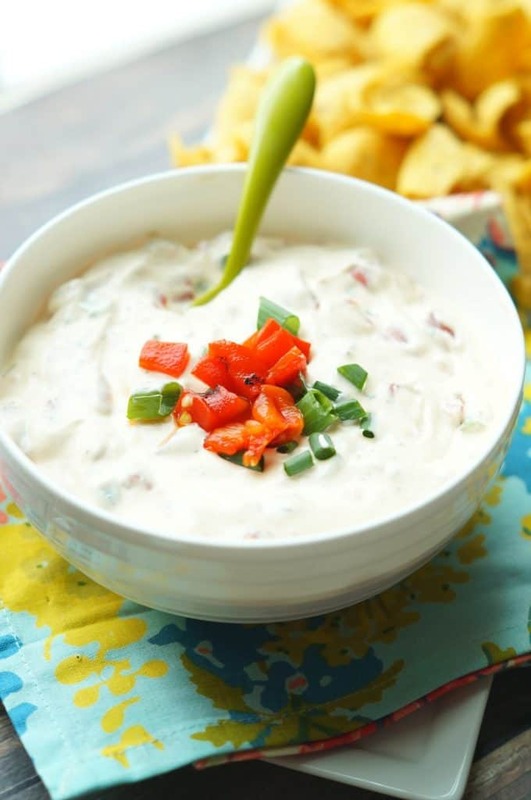 Everyone will love dipping their chips into this easy dip! Hey everyone! Amanda here from Old House to New Home sharing a simple and easy dip recipe, perfect for veggies or chips! I don’t know about you, but here in the Northeast, from the time between New Year’s and April, everyone hunkers down in their houses and only comes out for work and school, it seems. It is so cold and often so snowy so no one wants to go anywhere unless they have to! By the time April rolls around, we all have cabin fever and are so looking forward to nicer weather when we can once again get together with family and friends! With nicer weather hopefully right around the corner, it is time to start thinking about brunch and picnic season! There are so many fun reasons to get together during the Spring and early Summer! 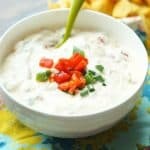 I love having easy dip recipes to bring for any occasion. My Peanut Butter Cup Dip is always a big hit for dessert and you never have to worry about anyone else bringing a dessert dip! Our favorite hot dip is jalapeno corn dip and my husband requests it all the time! 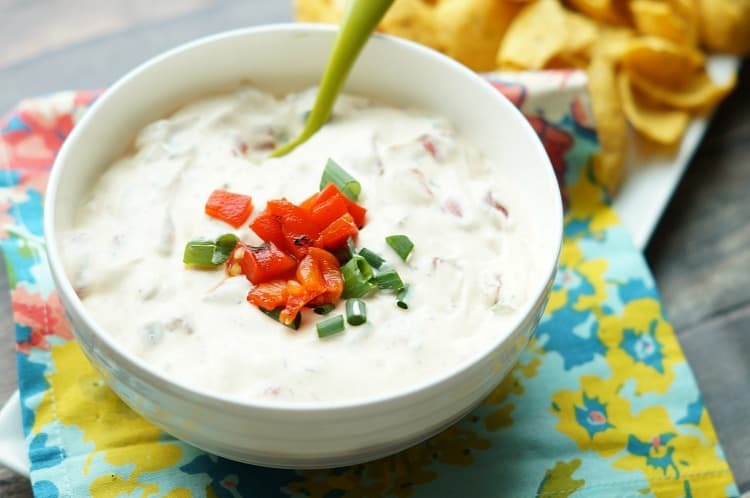 And now, with this spicy roasted red pepper ranch dip, we have a new favorite cold dip! This spicy roasted red pepper ranch dip only uses six ingredients and is served cold, making it the perfect dip to bring to any event for veggie and chip dipping. The spiciness comes from a jalapeno. I used an entire one because I love heat, but feel free to adjust! The raw crunch of the pepper is a great contrast to the chewiness of the red pepper. Roasted red peppers are one of my favorite ingredients and love the bit of sweet they add to this dip. They are so full of flavor and work perfectly with the ranch seasoning. If you love ranch, make sure to check out my spicy pretzel recipe, too! This spicy roasted red pepper ranch dip is spicy, creamy, and so full of flavor! 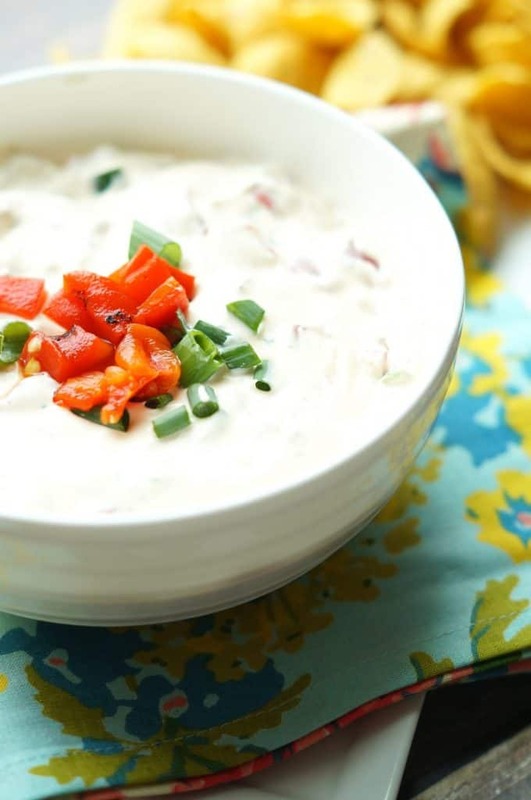 Perfect for a spring brunch or summer picnic, this easy dip won’t disappoint! Try this easy to make spicy roasted red pepper ranch dip. It's full of flavor and is perfect for an appetizer or even as a healthy snack! Mix all ingredients together, reserving a bit of red pepper and green onion for garnish. Cover and refrigerate for at least 2 hours. Serve with vegetables, chips, or corn chips.